Because The Princess And The Frog is intended for kids, the navigation through the game's menu system (and the game) is simple. The downloadable demo is located under "Multiplayer" (Thank you for that, Disney! ), which is the most sensible location. The credits are short and mostly skippable, and the download time is around one minute. The options on the main menu are rather small, and could definitely stand to be increased. Other than that, the menu is spot on in accuracy and does exactly as it is requested. 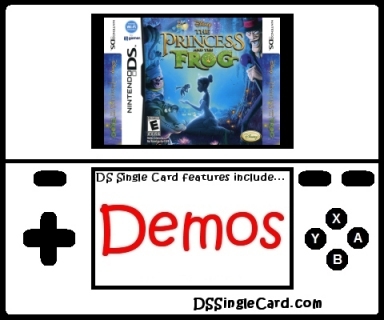 The basic gameplay in the downloadable Demo of The Princess And The Frog is simple and easy to use. The most complex skill is jumping because of the limitations on movement while in mid-jump, but it wasn't too bad or too difficult. The only touch screen component was the switching of what the next targeted Shadow would turn into, and even that can be done with the buttons. The button commands were associated with buttons that made sense, and the game always reacted appropriately. The Princess And The Frog features a downloadable Demo with what amounts to three simple tasks to complete. The Demo is the same each time it's downloaded. There are no additional modes and there is no true "multiplayer" to engage more than one player at a time (the Multi-Card Play feature is a co-op music performance, but that's not reviewed here). Graphically, the game looks excellent: while it's not the best looking game on the Nintendo DS, it's definitely in the upper echelons. Sound-wise, the game isn't bad, but it's forgetable and not necessary for gameplay if the volume has to be off, if you're in a public place, or if you just want to listen to your music instead. The downloadable Demo in The Princess And The Frog is accurate to the gameplay in the regular game and represents a spot a little way into the story, after Tiana has been turned into a frog (she starts the main game - and the movie, presumably - as a human). As per its intention, the Demo does serve as an excellent taste of what the game has in store. It is short, however, and has no randomness to it, so there's really no replayability. It's definitely worth checking out, especially for children that could be a little finicky about their games. There is reading required, because there are always notes popping up and instructions being provided. Also, while the game has a female protagonist (Tiana), it's true to the classic Disney hand-drawn 2D style Disney became famous for and will likely appeal to most kids once they actually pick it up, especially if they appreciate the film. Increase the size of the options/labels on the main menu. Give players more control during the mid-jump movements. Offer some multiplayer (Vs or Co-op) in addition to the downloadable Demo. Click here to return to the DSSingleCard.com The Princess And The Frog profile.